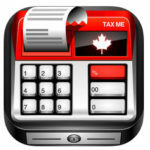 Tax Me is an easy to use tool that helps you quickly calculate Canadian sales tax for any province or territory. It will add the taxes to an amount that you enter. It can also reverse the calculation and provide the amount of taxes included in a total.